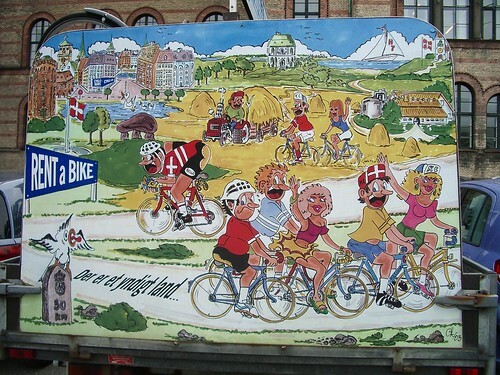 You see this truck quite often around Copenhagen. 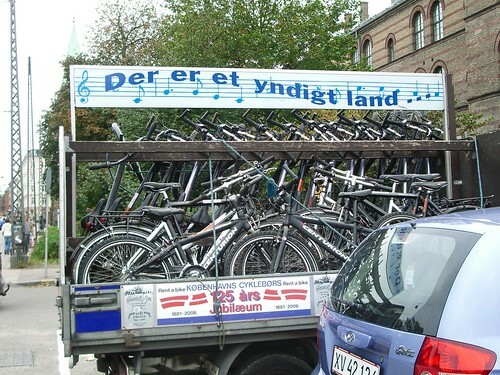 It's from the Københavns Cykelbørs - Copenhagen Bicycle Exchange - who rent bicycles to tourists as well as selling bicycles and doing repairs. The truck transport the bikes around to various locations where and if they're needed. The text on the artwork "Det er et yndigt land..." is the opening lyrics to the national anthem and translated it works out as: "It is a lovely country..." To hear what the national anthem sounds like when sung by 42,000 men, women and children at a national football match, click here. Anyway, there have been various owners over the years and the shop has moved about town until settling into the current location in the 1950's. The business celebrated their 125th anniversary in 2007, which is when the colourful artwork was produced for the truck. Yep, that's 125 years. Cornelius Steffensen founded the company in 1881, selling and renting bicycles as a supplement to his cigar company at first. He advertised that he had taught over 1500 ladies, gents and children to ride bicycles without a single accident. He was also the first private car owner in Denmark. Back in the heady days of the 1970's it was the largest bicycle rental company in Europe. Københavns Cykelbørs is located at Gothersgade 157.